Lima’s airport has double speaker announcements, two voluble Spanish voices jostling over the passengers attention, impossible to discern a word, especially if you don’t speak Spanish. I’m flying to the floating islands in the mountains. The rumour of the Spanish came with fleeing Incas down the hills, so the Uro people, native to the steep shores of Lake Titicaca, placed their reed houses on their reed boats and took shelter deep in the vast reed lands of the lake. They saw the roots of dead reeds float, and bundled them up in great quantities with a thick floor of freshly cut reeds on top, building floating islands hidden deep inside the bog. 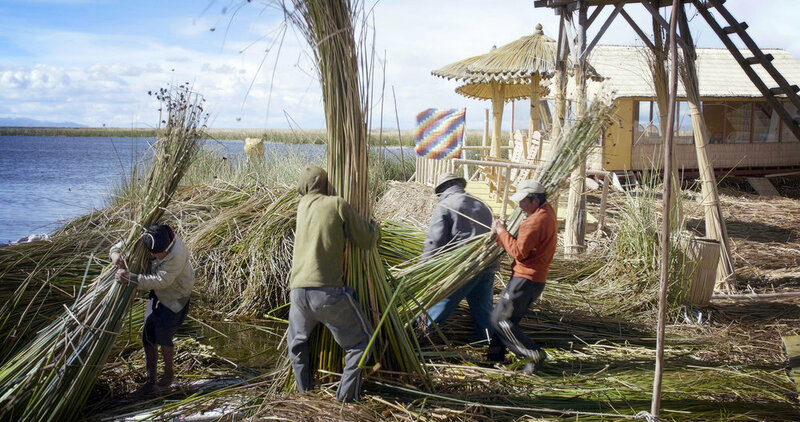 The Spanish came, the Spanish left, other strangers came and other strangers left, but the Uros stayed hidden in the reeds, living of the water. Five hundred years later it’s still afloat - although quite touristy, 50 or so floating islands, most for housing but some with specific functions, a gas station island, a church island, a school island. Easily to tow around, open urban planning taken to its logical conclusion. I arrive to my floating hostel in pouring rain, in a small blue dinghy with a stern Peruvian driver not minding my risky and ultimately failing selfie attempts. Dizzy from altitude sickness I nap in my brightly coloured reed walled room while the waves slowly rock the whole compound. New reeds need to be added every two weeks lest the island rot away. If you don't have a home, just build one. 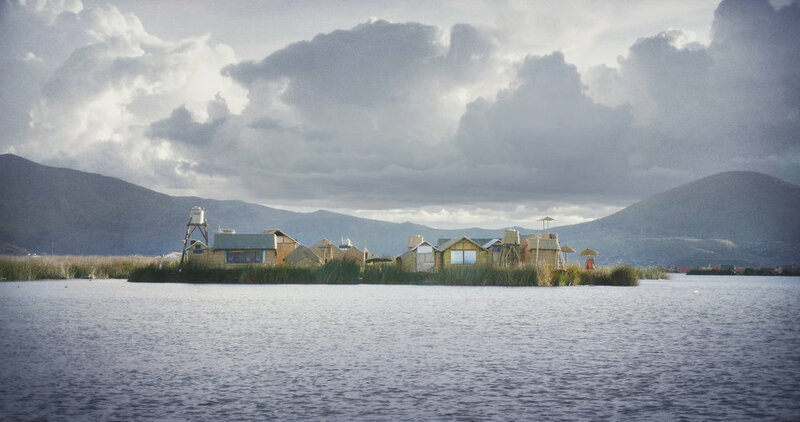 If you don't have land, build it on the water - like the plastic garbage tribe in Gibson’s The Peripheral. Or China’s current projects in the South Chinese sea. Or the Netherlands. We cannot build floating islands in the sky yet - but soon; let's bioengineer plants to produce helium infused bodies making floating forests encapsulated in their own atmosphere in space... My host Habraham is lukewarm in regards to my enthusiastic ramblings of the groundbreaking architectural implications of his lifestyle, two young kids and responsibility over his mothers floating hostel, he mostly seem to wish to move away from this moist and boggy barge. The manmade island not more than maybe 50 meters across, the two family cats ostentatiously bored with the small but consistent stream of American tourists stopping by here for a night of “amazing!" between Machu Pichu and whatever next on the itinerary. I'm the first guest in years to spend more than one night, unfortunately realising that the meny stays the same each day and that there really isn’t that much to do here if you don’t have a boat. Perched on a sun chair beneath the vast sky I get some editing done on my laptop, storm clouds rolls in over the mountains in the distance, small boats come and go trading goods, a man pulls up fish after fish through a hole in the floor of the island. Class rooms at the school island. Plastic bottles to increase buoyancy. The floating roots of the reeds.